Thank goodness for canned salmon. 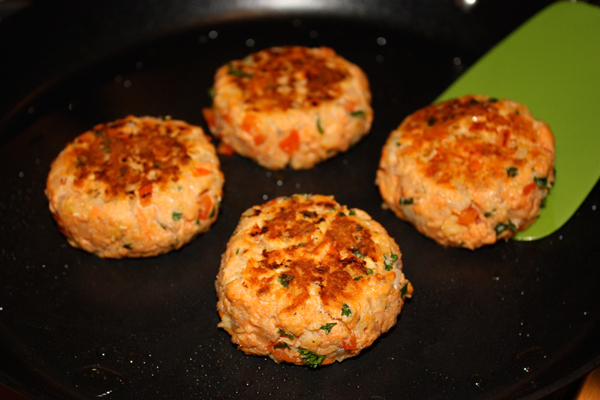 I always keep it on hand so I can make my quick and easy salmon patties. We know how important it is to eat fish, especially salmon, which is a good source of omega-3 fatty acids to protect your heart, and my recipe makes this easy dinner even healthier by adding red pepper, onions, parsley, egg, and my fresh whole wheat bread crumbs for added fiber. I made these delicious patties last night and served them with my Greek lemon potatoes and some steamed broccoli. There was nothing left on our plates! It seems like the body knows when something is doing you so much good because all of it disappeared in a flash. Another way I serve my salmon patties is with a side of steamed sweet potato, which is loaded with antioxidants and protects your eyes and lungs and boosts your immune system. Just peel, chop, and steam. Dinner is ready in 15 minutes! What an anti-aging combo! Oh… some more serving ideas…. I’ve also had these salmon patties with my Spaghetti With Greens, Sweet Potato Fries, Roasted Brussels Sprouts & Potatoes, and those awesome Roasted Vegetables. So eat fish often, and with this recipe, you can make a healthy 15-minute meal anytime. Quick. Easy. Healthy. You’re welcome! Click here for the recipe. 4 Comments on "Salmon Patties"
I made de salmon patties. Delicious. As I live in Thailand my friends here like scpicy food. I added some hot chili pepper to your recipe and that was a great succes. I have one question. Can I keep the patties in the freezer and use them later ? I have never frozen them so I can’t advise. I suggest trying to freeze just one as a test.